Do you have a dedicated team that's providing content for sales enablement within your organization? In the modern marketing world, companies which don’t build a vault of sales resources are essentially expecting their sales team to produce results without the proper tools. In this episode of The Social Business Engine podcast, I spoke to Viveka von Rosen about just that. In addition to being one the co-founders of Vengreso, where she has the role of Chief Visibility Officer, Viveka is an international keynote speaker, a Forbes Top 20 Most Influential Personal Branding expert, and a published author of 2 books and 2 courses on Lynda.com. On this episode, Viveka outlines exactly what content for sales enablement is, why it’s vital to the modern marketing function, and the results that can be expected by putting together a great vault of content which enables your sales team to influence buyers at every stage of their buying journey. Content marketing is the ongoing act of publishing and sharing valuable content which educates potential buyers on how to overcome the pain or problems they need to address. Content marketing builds visibility for a company, serves to attract and retain an audience, and ideally, influences that audience in their buying decisions. Sales enablement takes content marketing a step further, providing the sales team with the content they need in order to engage in conversations with potential buyers, address needs in specific ways, and answer questions that arise throughout the buyer’s journey. Viveka outlines how content marketing and content for sales enablement work hand-in-hand, and the importance of catering for different stages in the sales pipeline. Viveka points out that sales enablement content needs to be organized into a “vault” of sorts which sales teams can draw from on an “as needed” basis. In the modern sales environment, sales enablement content is not an option if you want to empower your sales team to close more deals, because buyers are hungry for this content. Most sales professionals have heard the traditional 3-step description of the Buyer’s Journey. 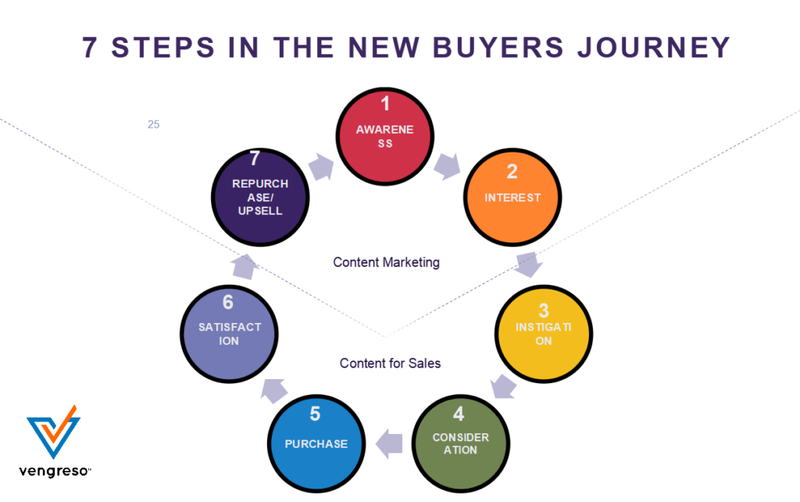 Viveka expands that to 7 steps when she discusses content for sales enablement, because the additional steps define different types of content the sales enablement team can create. As Viveka explains her expanded 7-step buyer’s journey, she's careful to point out that though she’s speaking in terms of “steps,” marketers and sales professionals should never think of the buyer’s journey in linear terms. By that, she means that it always loops around and starts over - it’s therefore better to think of it as a circular journey. Practically, that means you should never close a deal and walk away as if your work is complete. You’ve got to continue the process again with that customer to earn referrals and repeat purchases. Not only will you generate more leads and make more sales, but you’ll also reinforce the value and service you’ve already provided to existing customers, solidifying the relationship for the long haul. [2:39] Why talk about sales enablement on a marketing podcast? [7:40] What is vaulted content and how does it differ from “gated” content?